Home delivery coffee clubs – have your coffee delivered to your home. My monthly delivery of four Seattle coffees from Bean Box. 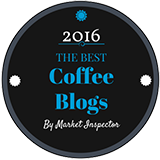 Coffee clubs have been around for quite some time, and certainly offer some useful benefits. You sign up, and usually get some kind of gift as a thank you. 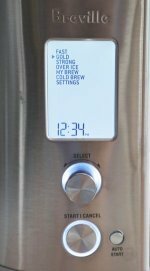 You then choose the coffees you like, set the frequency for your home deliveries, hand over your credit card information...and that’s just about it. It’s a great idea if the amount of coffee you consume each month is fairly constant. And even if it isn’t, most coffee clubs allow you to change the frequency of deliveries at any time. They will also allow you to change your choice of coffees. So just because you selected a particular coffee or group of coffees for one month, doesn’t mean you can’t change it for the next. How do you choose which coffee club to join? Our advice is to experiment. Try a few. Some of the big name coffee brands offer subscription services, but we have a soft spot for some of the smaller, more interesting newcomers. 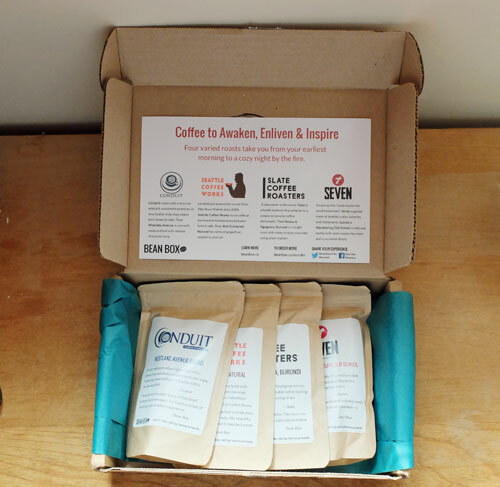 Here are some newer, smaller coffee suppliers getting into the home delivery business. These are entrepreneurial startups, focusing on taste and quality. And don't always expect them to give you a wide choice of coffees to choose from. Some just send you what's great that particular week or month. Enjoying great coffee can be about being surprised sometimes. Crema.co. These guys are coffee curators, sourcing coffees from independent small-batch roasters. They offer a neat service that includes a "Pause" function. Handy if you're going to be out of town. Read our review here. DripJoy. With these guys you get both the coffee deliveries and a single serve brewer as part of the package. Read our review here. Atlas Coffee Club Read our review here. Brothers Coffee Company Read our review of them and one of the featured coffees here. Joe's Brew Club You get delivery of both coffees and biscotti. Great idea! Our hands-on review here. Angels' Cup You get coffee in sample-size packs, plus a tasting app to help you taste each coffee like a pro. Our review here. Drift Away Coffee Try different coffees, then use their site to let them know which ones you like best. 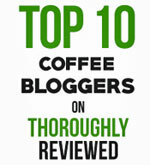 See our review of one of their coffees here. Bean Box We have tried a few of their coffees. See one our reviews here. We like these newer companies and will add more to the list when we come across them. 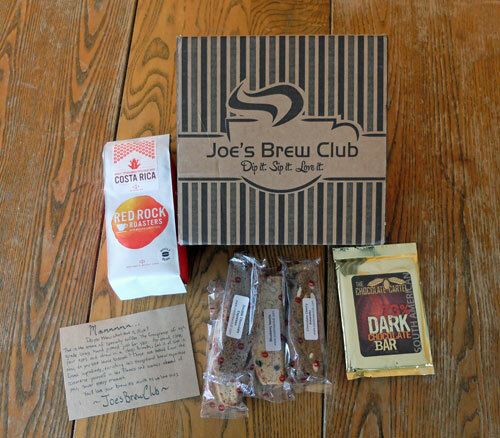 Monthly coffee, biscotti and chocolate from Joe's Brew Club. 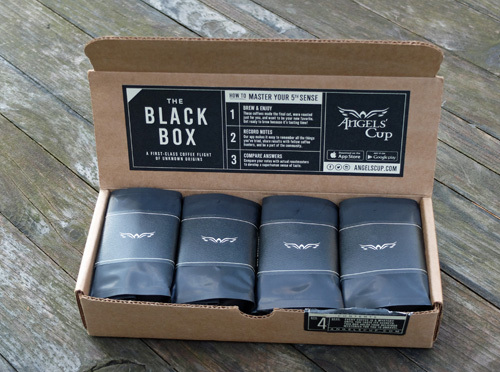 A very classy presentation of sample coffees from Angels' Cup.